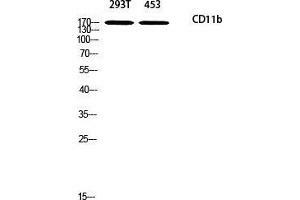 Western Blot (WB) analysis of 293T 453 using CD11b antibody. Specificity CD11b Polyclonal Antibody detects endogenous levels of CD11b protein. Characteristics Rabbit Polyclonal to CD11b.